A new SDR# driver for the RTL-SDR that comes with manual settings for the LNA/Mixer and VGA gain stages as well as software decimation (in Russian use Google Translate) has been released on rtl-sdr.ru. The three seperate gain stages offer much greater control over optimization of signal SNR and interference management. The decimation feature allows you to sacrifice some bandwidth for increased ADC bit resolution. This means that using the decimation feature can significantly improve the SNR of a signal. Update: It turns out that decimation is already used in the existing SDR# code, so using decimation in the new driver won’t improve the real SNR, only the visible SNR – so there will be no audible improvement. It will however allow you to effectively zoom in on the spectrum without loosing visible resolution. Also it allows you to use a higher sample rate (2.8 MSPS) which will improve SNR, whilst maintaining a reasonably sized (small enough) visible bandwidth for narrowband signals. The driver is based on Oliver Jowet’s modified driver so it should also have the capability to tune down to 13 MHz or lower. To use the plugin simply download the zip file and copy the files into the SDR# folder, replacing all existing files. Previously we posted about another driver with similar capabilities, but this driver was never released to the public. There was also another driver with just the three gain settings released earlier which this driver appears to be based on. Not working with most recent SDR# (v1.0.0.1434). Extracted to directory, followed instructions in the readme (add line to FrontEnds.xml), noticed that the rtlsdr.dll was probably incorrectly named (should be SDRSharp.R820T.dll) but even renaming doesn’t work. No option appears in the list of frontends. It used to work with the original driver. sdr# loads but nothing works. does this works with sdrsharper? how to install it in sdrsharper? I could make it work in SDR# but not in SDR #’er. When running it in SDR sharper, it errors out with something like this: “there was an error loading the file (the driver, duh!) because it was created in a newer runtime than the one presently running”. With SDR# and with *no* HF antenna, I was at least able to pickup one AM station, just slighly before 15 Mhz… but it’s late morning now, so propagation doesn’t help. But SDR sharper, is better on so many levels… so what’s the best working driver for SDR sharper that will let me do the same thing? I started to play around with this driver tonight, so I was seeing if it would tune down to 14Mhz (20m ham band). I hooked it up to my multiband vertical. It picked up a few signals down in the band,. Since the band was mostly dead I tried to tune into the other bands. At 24Mhz, 21Mhz and 18Mhz it just wouldn’t tune. Then I tried 10.00Mhz and it was receiving WWV! Then I went down to 80 meters and sure enough I picked up a conversation on 7.204Mhz LSB! Totally amazing! With the gain settings up near full, I’m currently listening to a fairly strong station on 1.386KHz!! Has anyone else the I/Q correction doesn’t seem to work right? I get a spike that euventually drops down; but it’s always slightly there and seems to contain a little modulation. Wow, this is really amazing … I get up to 10 dB more S/N visually in the display, but until now I could not hear any real audible S/N improvements when listening to very weak signals and switching between the two drivers. 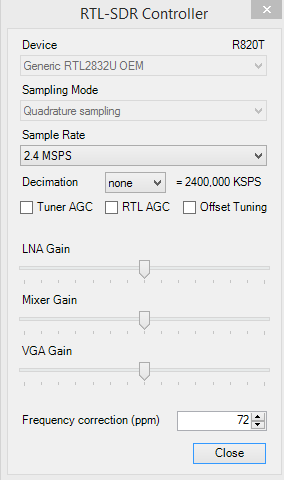 I currently run the new unmodified R820T2 stick, which is really nice and low noise and my experience is that when optimizing S/N with the new tuner settings, what matters by far the most is the LNA gain, as expected, then the mixer gain doesn’t improve anything here, so I keep it in max position, and the VGA gain is usually best in at around 70- 90% of the scale. What really blows me away is the spectral resolution and clarity this driver provides when using decimation at its highest settings, even when FFT resolution is only on 2K samples … I can see details I have never seen before … must be groundbreaking for radio astronomers. A little hint to any Europeans on here, tune to 143.050 MHz for Graves bistatic space radar in France, turn your antenna towards its location between Dijon and Besancon and you will see every little bounce super clear and sharp. It also seems to be totally stable when switching bandwidth and decimation on the fly, even on my slow old notebook – great work on the software side, many thanks! Now being able to e.g. detect two way radios individual key up footprints or determining physical movements from doppler shift opens new possibilities for amazing plug-ins. I think I really have to get back into coding … but this is really deep math stuff – my highest respect and thanks goes to the developers. Anyone know what the “TV” stands for in the sample rate selections? Holy geeze! I’ve never been able to see the space between the carrier and sub-bands before. This is outstanding! Wait, that’s not right, and I can’t edit/delete post. You’d think I’d know my own server address; not enough coffee. This new driver can be used in combination with keenerds driver? I use it with keenerds driver and it still seems to work fine. This seems to replace the keenard drivers based on the files in keenards and this. did someone compare keenerds with this driver? wich one offers better performances with low signals?